1. Increase activation of the muscle responsible for tone and definition. Type II muscle fibers are the larger fibers responsible for creating muscle definition and “tone.” Type II fibers are responsible for generating muscle strength and power and are controlled by type II motor units – the connection of the nervous system to the muscle which acts as a spark plug to initiate muscle action. If type II motor units and muscles are not used the motor units lie dormant and the muscles become smaller and lose definition. Strength training with heavier weights and power training with explosive movements will keep the type II motor units and muscle fibers active improving their tone, definition and metabolic function-the ability to burn calories while at rest. 2. Improve architecture of the entire myofascial system. Anatomy books traditionally show muscles as being separate, distinct units. In reality muscles are surrounded by tissue known as fascia which links all muscles together into one inter-connected system. A more accurate way to think of muscles is not as independent units but as different layers connected by elastic webbing (fascia and connective tissue). Fascia has elastic properties and surrounds ALL muscle fibers from the larger bundles of fibers traditionally referred to as individual muscles down to individual strands of fibers. The layers of fascia lie against one another like the different layers of plywood, except that, unlike plywood, the layers are designed to slide against one another during movement. If the layers do not experience this motion regularly, or if the fascia does not lengthen the full range-of-motion it is capable of then collagen fibers can begin to form and create adhesions. Lack of movement, repetitive motions or poor hydration can all result in the formation of an adhesion. Collagen is an inelastic fiber that can develop between layers of fascia and limit the ability of muscle tissue to lengthen and shorten. If collagen starts binding between layers of muscle it can reduce the ability of that muscle to move a joint to go through a full range-of-motion. Doing the same exercises over and over, or using exercise machines which provide a strict path of motion can actually exacerbate this problem and reduce the ability of muscle tissue to efficiently lengthen and shorten. Doing exercises that gets the body moving in multiple directions, lifting different weights-from light to heavy-at varying rates of speed will help all of the layers of fascia maintain an optimal ability to lengthen and shorten while controlling movement and significantly reducing the risk of developing adhesions. 3. Enhance levels of the hormones related to maintaining a youthful appearance. Going to a doctor to receive GH injections can be very expensive and painful. Paying for a prescription for Testosterone can be expensive and there is the risk of side effects from using synthetic hormones, namely your body will become reliant on the exogenous (outside) hormones and stop producing its own hormones. Reduce the risk of harming your endocrine system and boost hormone levels naturally by lifting heavy weights or training explosively. The only side effects are more sweat, better sleep patterns and weight loss due to a greater level of energy expenditure from the increased exercise. As you can see exercise can change the physiology of the body in a way that slows down the biological aging process. 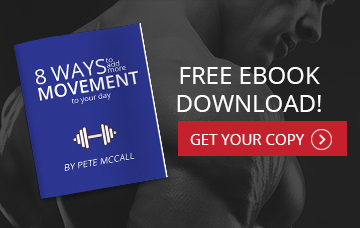 NEW TO PETE MCCALL FITNESS?